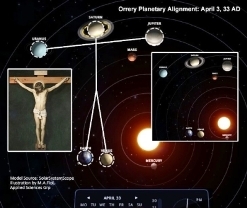 The planets Saturn, Uranus, Jupiter, Earth and Venus align to form what looks like Jesus on the cross with the head, the hands spread out and the legs together in accurate positioning, rotation and on a galactic scale. Indeed, even Saturn's rings can be viewed as representing the 'halo' or 'crown of thorns.' Most noteworthy, is the date of the alignment, the day commonly viewed as that of Jesus' actual crucifixion, April 3, 33 AD. EDITOR'S NOTE: As I read this striking article today, I was immediately reminded of the similar "sign" our Creator has embedded in each of our own bodies—the protein known as the 'glue that holds our cells/bodies together called "Laminin." It is also in the unmistakable shape of the Cross of Jesus Christ. (Watch this video from Passion's Louie Giglio here) How like our amazing God to put both a sign of His great love for us in the heavens to see and discover; and the same sign inside each of us! -Aimee Herd, BCN. It was while researching a manuscript that the UW-Madison history grad came across the odd planetary formation using multiple heliocentric orrery models to study the date of Jesus' death via a top-down view of the solar system. • The 'crown of thorns' (or 'halo') is represented by Saturn's rings. • Most notable finding perhaps is that the two 'hands,' Uranus and Jupiter, spin in opposite directions as do the two 'feet,' represented side-by-side by the planets Earth and Venus. "Those planets rotate as opposites or mirrors, like your left and right hand and your feet," says Fiol, who spent years researching historical figures, works and symbols such as pi to find patterns and underlying meanings. "It was Da Vinci's The Last Supper that led me here," he quips cryptically and without irony.